The use of auxiliary separation mechanisms to manipulate the separation selectivity of metal complexes and organometallic species is reviewed. 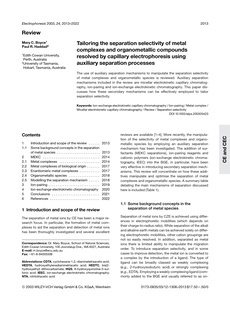 Auxiliary separation mechanisms included in the review are micellar electrokinetic capillary chromatography, ion-pairing and ion-exchange electrokinetic chromatography. This paper discusses how these secondary mechanisms can be effectively employed to tailor separation selectivity.